As my assistance was not essential during the 2nd day of my wife's wholesale craft show in Las Vegas, I decided to go somewhere other than the Strip or the completely underwhelming pool at the Las Vegas Hilton. Remember the old westerns? Gunsmoke, High Chapperal, Hang 'Em High? I always thought it would be sort of cool to see an old western "Ghost Town." So, I searched and found that there was one in Rhyolite, NV, not two hours from Vegas... just head northwest and turn left at Beatty, NV. Well, hello. Sometimes a small spot on the map brings pleasant surprises, and Beatty, NV, was one of them. Maybe they've been baked in the sun too long, or perhaps they just have a good sense of humor. It's a small town, with a few shops, a tiny casino, a couple restaurants. Obviously, if you want to stop, you need to park. Well, worry not! And this out-of-towner appreciates the tips on which way is in vs. out. But, hey, what's this? Where in the world am I? It's literally a funny little town. But that wasn't my first waypoint, so I refer to my directions and just need to take a left to go to the ghost town! Just up the hill and... whoa. Rhyolite is such a forgotten little ghost town that it's not programmed into my Garmin. But go down this road a bit, and take a right where the... well, where the dirt road is, and just go a short ways until you "see" it. Well, sure, but... uh, what's that? Why, of course! It's a huge metal miner and a penguin! Just stay focused and keep driving. 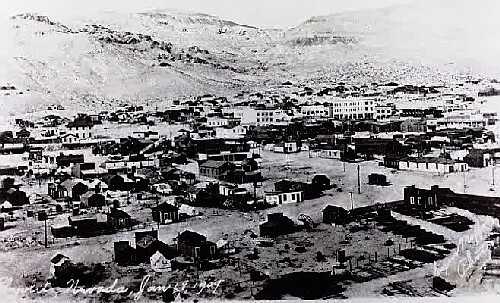 The classic western ghost town presupposes a main street, with a barber, a hotel, a jail, and a saloon, all made of lumber. Does this area look to be a likely source for lumber? Well, no. So they used mostly materials that were at hand. Basically, add water and cement to what you're walking on, and you get concrete. Details on Rhyolite can be found by clicking HERE. Unfortunately, despite a building with a sign pointing towards it that says "Information," no one was there, and there was no information. But, I guess that's what you get when you go to a ghost town, and doubly so when you're in the middle of northwestern nowhere alone. From the website above, here is what it looked like in 1909. And here's how it stands today. Mostly rubble, and not exactly the kind of ghost town I was seeking. Still, it was an interesting place to stop. And for reasons other than just the "ghost" town. Built at the same time was a home constructed of an estimated 50,000 bottles. Why? Because they were abundantly available from beer, soda and medicinal uses, and lumber wasn't. (Obviously, it has been restored to a point). Do you really expect to find something like this in a ghost town in the desert? But wait! There's more! That strange miner and penguin... they're actually an exhibit from the Goldwell Open Air Museum. It's an (sparsely populated) exhibit of folk art, a full measure below the genius of Howard Finster, but it certainly chases a vision unassociated with commercial artistic expression. I came to see a ghost town, so why am I taking pictures of this stuff? Location, location, location. And how could I not? They all fit together - Beatty, Rhyolite, and Goldwell - a quirky but enjoyable detour. Additional photos and comments from each of these sites can be viewed by clicking on the names, respectively.